Black Friday – TopVeg eBook Offer! TopVeg has released a new eBook “Vegetable Growing for Young Gardeners” & has a Black Friday offer of £ 4.99. 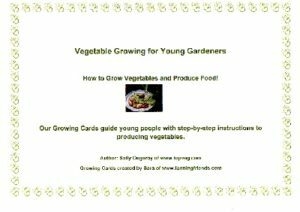 It is written for young people & explains How to Grow Vegetables and Produce Food! There are 21 growing cards included in the book, which can be individually downloaded and printed out. Our Growing Cards, created by Sara of farming friends, guide young people with step-by-step instructions to producing vegetables. The Growing Cards demonstrate how to plant, look after and grow vegetables in easy to follow stages. This eBook contains cards which take young people through the fundamentals of growing plants without them loosing interest. Young people can follow the steps of growing vegetables as they watch the vegetables grow. Simple introduction to growing vegetables. Well crafted growing cards ready to print out. You are not alone – If you get stuck at any part of the process or have any question, just email us & you will get an instant response. How to plant potatoes, onions and leeks. How to look after growing vegetables. What you need, a list of basic tools. Ideas of what to grow. There is a 10 day money back guarantee if not completely satisfied.